As I wrote in the previous two posts, on 11th and 12th February hubby and I had been to Sapporo to see the annual snow festival. 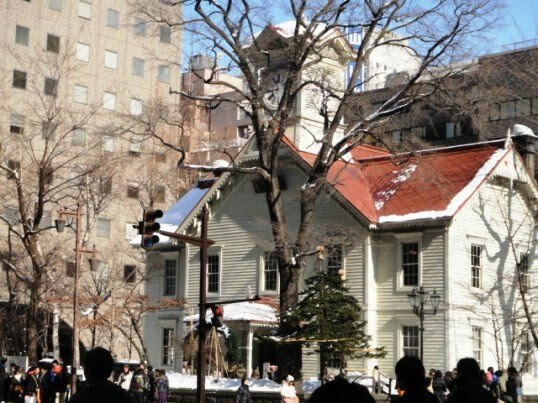 On 12th February, we visited Sapporo Clock Tower before going to the snow festival site at Odori Park. The tower is located just north of Odori Park. Sapporo Clock Tower is a wooden building, which is a major tourist attraction and is a symbol of Sapporo. 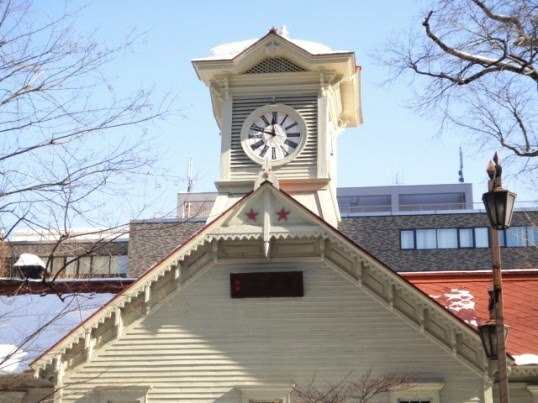 The tower building has an American design and is one of the few surviving western-style buildings in Sapporo. 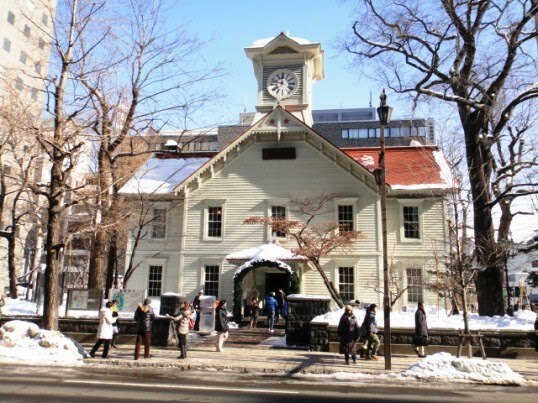 The tower was built in 1878 and was the drill hall of the former Sapporo Agricultural College (now Hokkaido University). The clock was installed later in July 1881 by a Boston based watch company. The clock still continues to run and keep time, and the bell rings every hour. 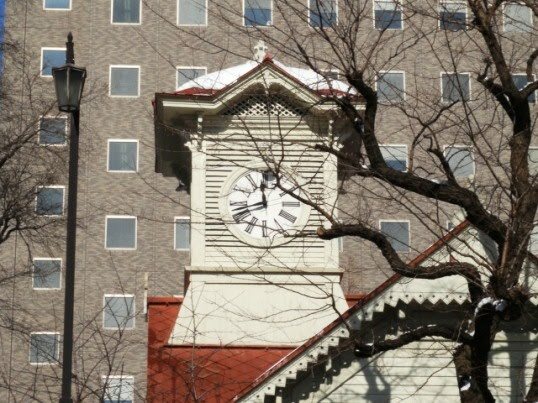 We took several photos of the tower building and the clock for the sake of memory. Presently, the building has a museum that introduces the history of Sapporo and the Agricultural College. We skipped entering inside the tower building. 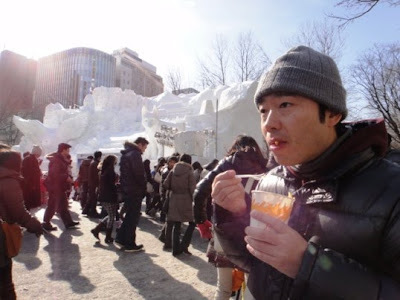 Later we visited the snow festival site at Odori Park about which I have written in the previous post. 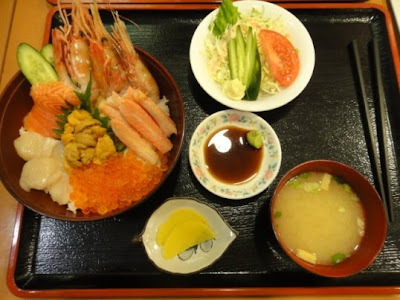 At Sapporo we had various kinds of Hokkaido foods. 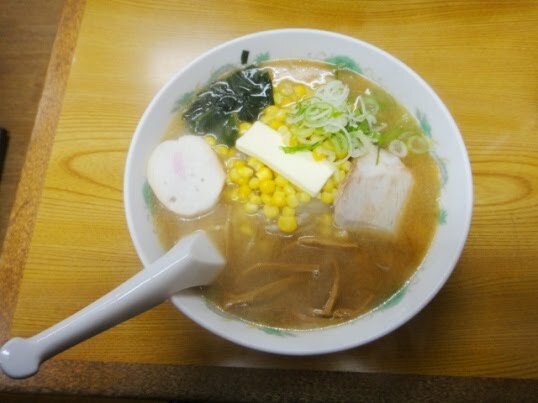 On the night of 11th February, hubby and I had a bowl of miso-butter-corn ramen, a Sapporo specialty, which was delicious. 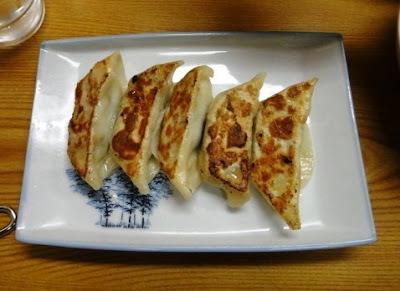 We also enjoyed having a side dish of gyoza. Hokkaido is a leading producer of potatoes in Japan. On both days of our stay in Sapporo, we had potatoes cooked in various ways like baked, grilled, boiled, and fried. All these ways of cooked potatoes tasted wonderful. 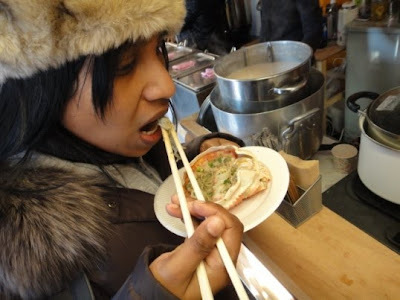 On 12th morning at Odori Park snow festival site, I had an experience of eating fresh grilled crab meat in a delightfully unique way. 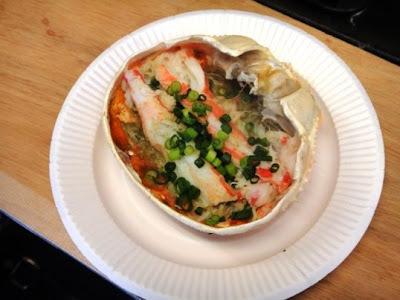 Kani kourayaki of Monbetsu City in Hokkaido is a crab specialty where crab meat is grilled and served in the crab shell. 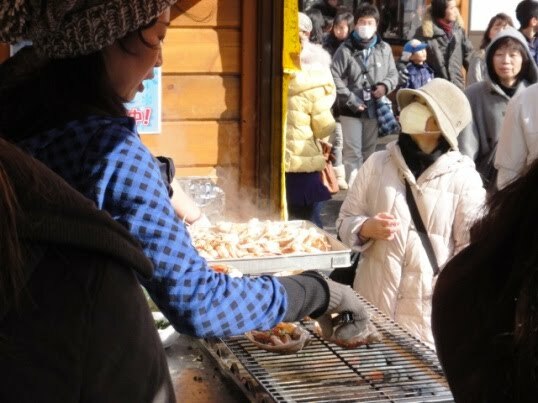 While the lady at the food stall grilled the crab, the mouth-watering aroma wafted through the air. I ate the grilled crab meat out of the shell itself. It tasted rich and heavenly. At another food stall hubby and I enjoyed having grilled beef on a stick. 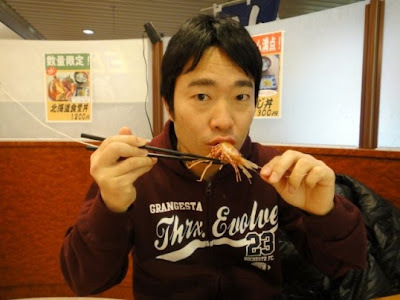 The meat was flavorful and juicy but for me it was a bit tough and hard to chew. At yet another food stall we saw the stall owner grill various kinds of seafood. 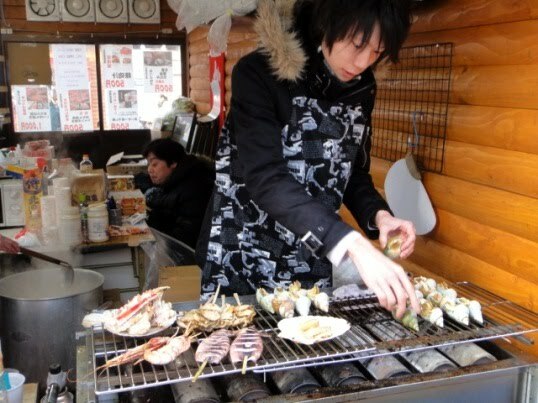 We had grilled squid at this stall. 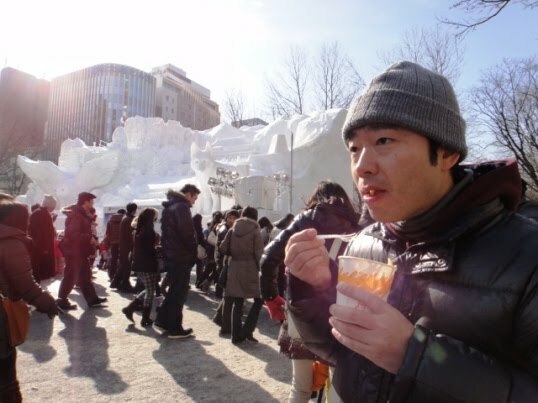 We ate too much food at the snow festival site but it was worth it as everything tasted wonderful. During our return to Akita on 12th evening, we reached about an hour early to Shin Chitose airport at Sapporo. So we had an early dinner at a restaurant inside the airport terminal building. 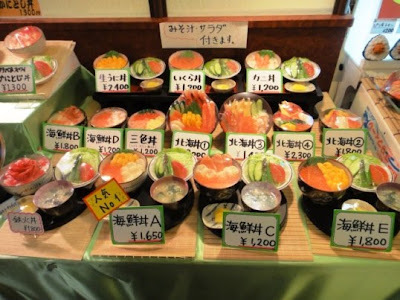 Fake plastic food samples were displayed in front of the restaurant. They looked so real and tempting. 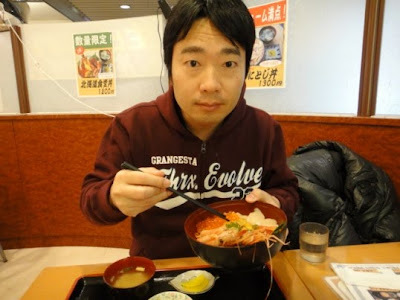 I ordered a set menu of kaisen donburi and hubby ordered a set menu of uni donburi. Kaisen donburi is a rice bowl dish with different kinds of fresh seafood toppings already prearranged beautifully. 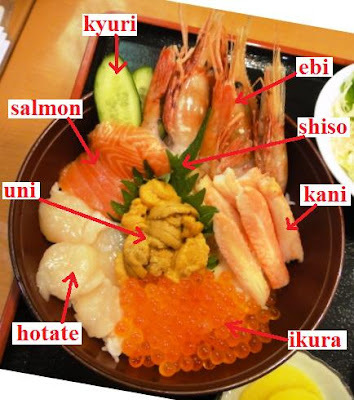 Kaisen means seafood and this dish had ebi (shrimp), kani (crab), ikura (salmon roe), hotate (scallop), uni (sea urchin), salmon, kyuri (cucumber), and shiso (perilla) leaf as toppings. 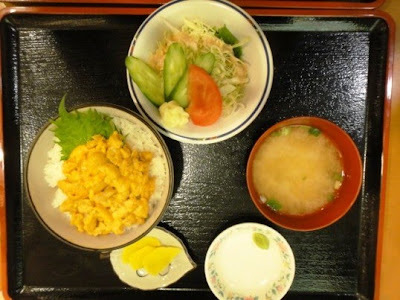 Uni donburi had only fresh uni topping on a bowl of rice. Both the set menus consisted of miso soup and a salad of shredded cabbage, fresh cucumber, and tomatoes. We tasted each other’s food. Hokkaido is famous for seafood and we enjoyed our dinner of various kinds of seafood very much. 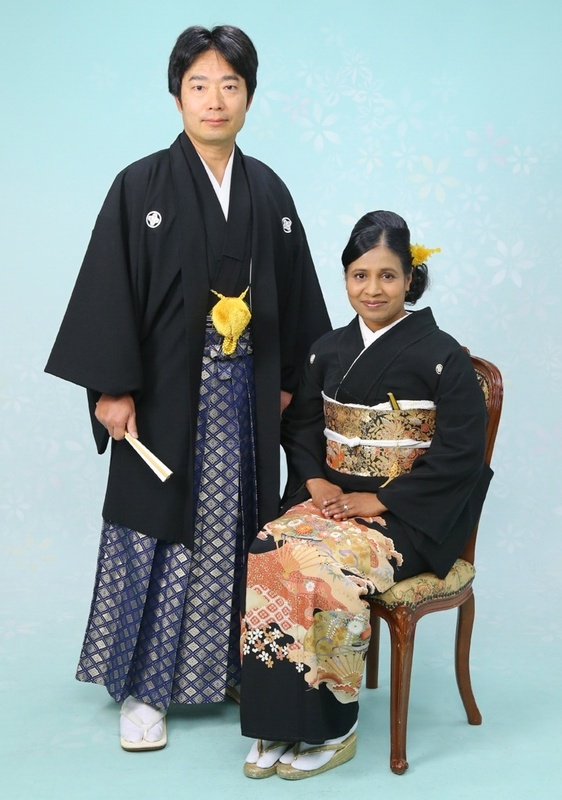 Hubby and I had a nice time in Sapporo on 11th and 12th February. 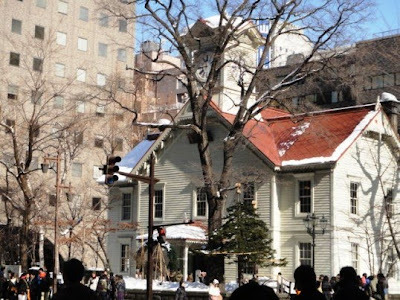 We visited Sapporo Clock Tower as well as the snow festival site at Odori Park. 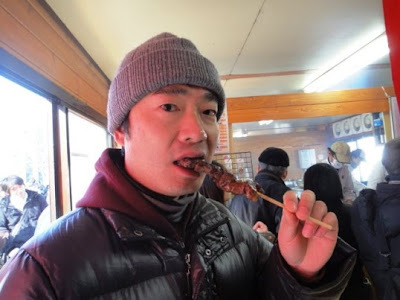 We also enjoyed eating various kinds of Hokkaido delicacies on both days. 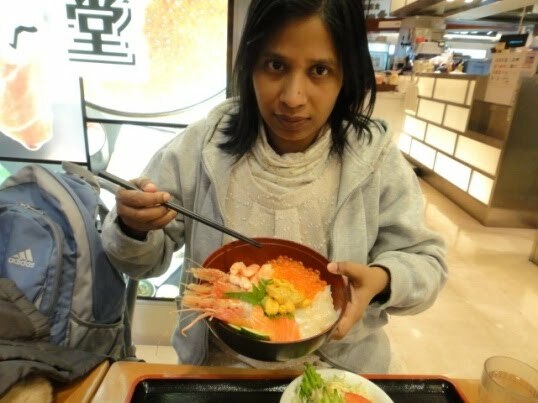 Wow, your pictures bring back the memory of my Hokkaido visit just last month. I really like Hokkaido milk, cream, squid, and ramen. I found your blog Saturday morning and since then I have been reading all your posts. 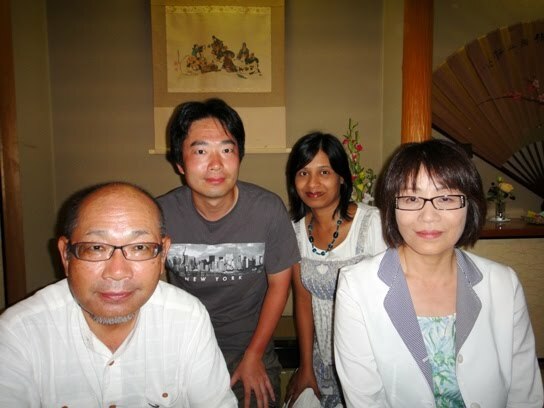 Thanks for sharing the trip that you both take together. 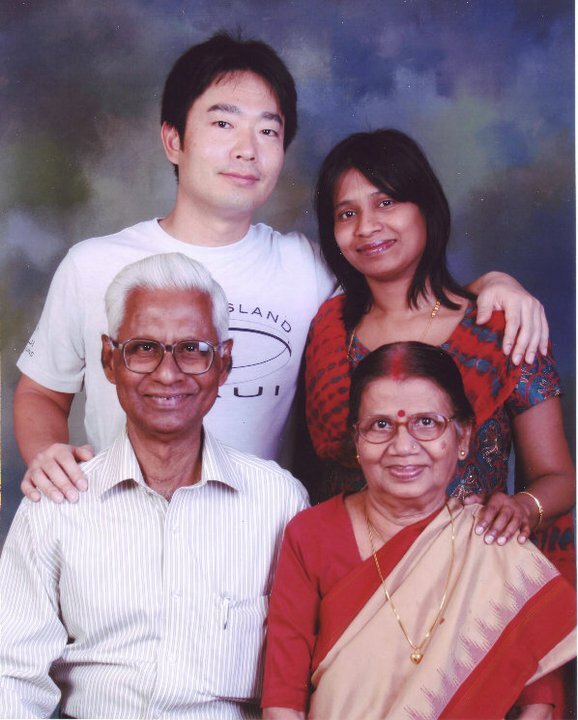 I will also love to read about the trips and things you do without your husband, how you like staying home after working for so long, living in japanese boonies as Indian. Thank you very much for your comment Anil. 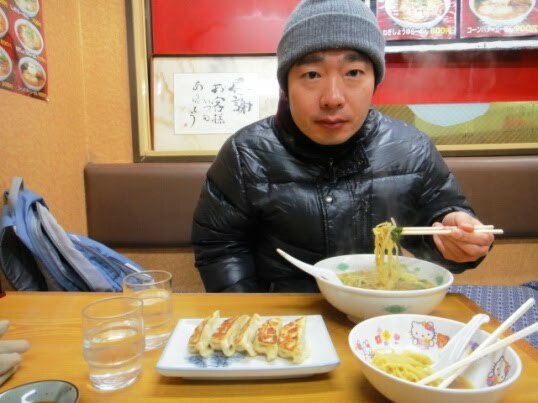 Hope you had a nice trip to Hokkaido. It is very cold there nowadays. Life in village is very interesting but can be monotonous sometimes. But now I have got used to this and have come to appreciate this very different lifestyle as compared to my previous researcher life.